They were seen laughing after putting the cat inside the dryer. In a CCTV footage that has gone viral, two men are seen picking up a cat at a self-serve laundromat in Taman Gombak Ria and placing the poor thing into a coin-operated clothes dryer. They then turn on the machine and are seen cracking up at what they think is funny. It happened around 12.50am on Tuesday night, 11 September. The less than three-minute-long CCTV footage was first uploaded by Malaysia Animal Association. 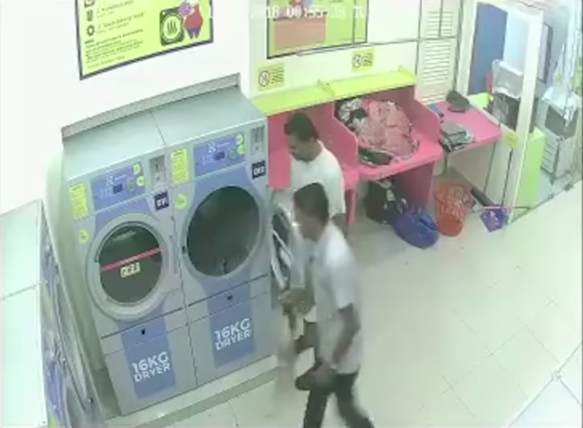 As per the video, while the two men left with their clean laundry, they came back a few seconds later to put coins into the dryer to play out their evil act. They both left the premises immediately after starting the machine. It was only after about eight hours when another customer came to the laundry at around 10.30am that the cat was found dead and the machine splattered with the poor creature's blood. According to Malaysia Animal Association, they were contacted by the laundry shop management for advice before lodging a police report together with the video evidence. "Based on the information gathered, the two are locals and probably live nearby as they wash their laundry there regularly. "What they did was cruel. I hope they will be punished accordingly under the Animal Welfare Act 2015," MAA president Arie Dwi Andika told NST Online.